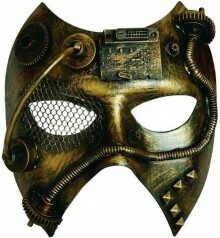 Bronzed effect mask decorated with various pipes and gears, a central circuit board placed on the forehead with a raw edge wire mesh cover over the right eye. March 2017 Release. Great for parties.